Screen images from the android version of the San Diego County Water Authority’s app. The San Diego County Water Authority on Tuesday launched a smartphone app for people to report water waste like broken sprinklers, excess irrigation and potential violations of local water-use rules. 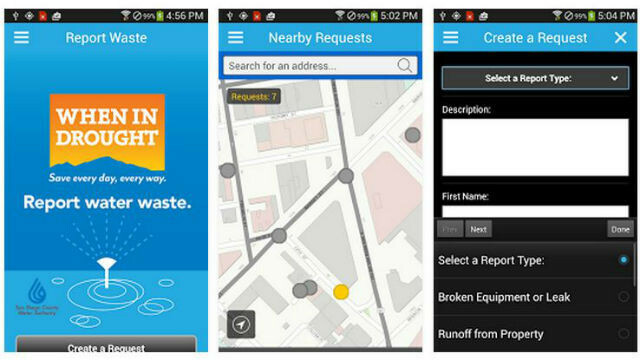 The “When in Drought, Report Waste” app, developed in conjunction with the Water Authority’s two dozen member agencies, will also allow users to transmit photographs or video of the problem. The app is free and available for both iPhone and Android devices through their respective app stores. There also is a link on the water authority’s website. Users can report waste by entering an address or using the feature to pinpoint the location, then select from a list of common problems and have the option to enter more detailed information. The app includes other features such as links to online water conservation resources and rebates, a local water agency map and locator, and additional information about local and state restrictions. It can be used across all areas of the county served by the water authority’s member agencies. With California more than four years into a drought, Gov. Jerry Brown in April ordered a 25 percent statewide cutback in water consumption, with individual water agencies given varying conservation targets. San Diego County water customers combined to reduce consumption 30 percent in May from 2013 levels, the standard set by state water officials. The countywide reductions were 26 percent in June and 32 percent in July.